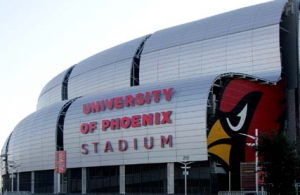 The Arizona Cardinals and Cox Business announced a new multi-year agreement that makes Cox Business the “exclusive technology solutions provider” for the team and its home stadium, the University of Phoenix Stadium in Glendale, Ariz. The new deal sees Cox Business replacing CDW as the main integrator for technology deployments at UoP Stadium, a venue that regularly sees big-time audiences for NFL games, Super Bowls, and the Fiesta Bowl. While the Cardinals and Cox Business have been partners since 2006, the new deal calls for Cox Business to add in support and development of the stadium’s Wi-Fi and networking infrastructure, as well as to provide technical support. Previously, CDW handled those tasks at UoP Stadium. Extreme, whose gear is currently used in nine other NFL venues, was part of a Wi-Fi deployment at the Linc done back in 2013, part of at $125 million renovation done at that time. Neither Extreme nor the Eagles would comment about the switch to Panasonic.